Paneer, as I always say is important in our diet. We should try that we can eat paneer atleast once a week. When I have enough time in hand, paneer butter masala, or matar paneer or paneer tortilla wraps is my choice. However when time is less and something delicious and quick is to be made then Paneer Bhurjii, Chilli Paneer is the choice. 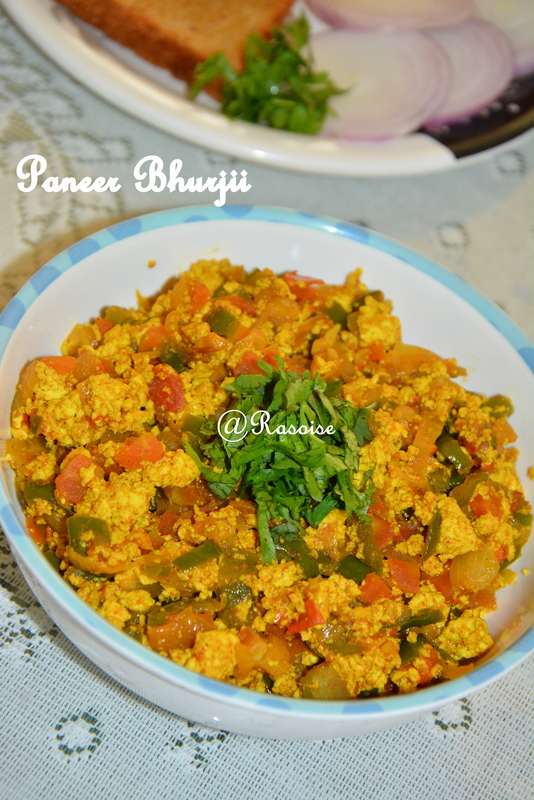 This paneer bhurjii is nutritious as it contains veggies like capsicum and carrot. The amount of veggies can be altered as per the taste required. You can also add some peas to enrich the flavor. I have used kitchen king masala, which can be replaced by pav bhaji masala as well. 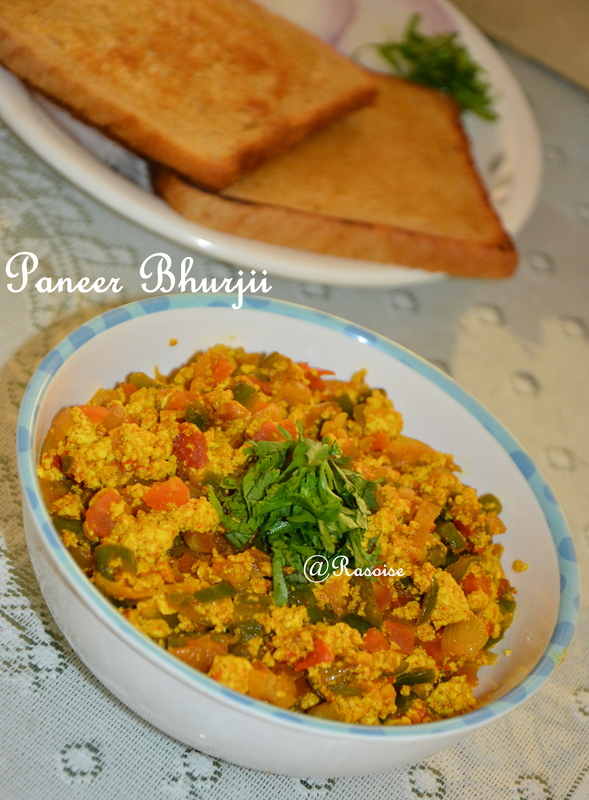 Here I come with very simple yet delicious recipe of paneer…. Green Chillies (chopped) – 2nos. Heat oil in a kadai and add onions and green chillies and fry until the onions turns transparent. Add ginger-garlic paste and sauté. Add capsicum and carrot. Saute till half cooked. Add tomatoes and saute until it becomes slightly mushy. Now add all the masalas. Saute for a while. Add crumbled paneer and salt and saute for few minutes. The mixture should be moist and not dry. Garnish with chopped coriander and lemon. Serve it hot with Roasted Butter Pao , Toasted Butter Bread or with Plain Roti, Naans. Take a big bowl and sift the maida and wheat flour. Add rawa, oil, salt and water. Knead into a tight dough. Cover with a damp cloth and keep it aside for half hour. Heat little oil, add cumin seeds. Add green chilli and ginger paste. Saute for a while and add mashed peas. Add all the dry spices and sauté for two minutes. Add gram flour and sauté for another minute. Allow it to cool at room temperature. Make equal sized eight balls from the dough and Roll out one portion of the dough into a circle. Place one portion of the stuffing in the centre of the circle. Bring together all the sides in the centre and seal tightly. Heat Oil at medium flame for deep frying. 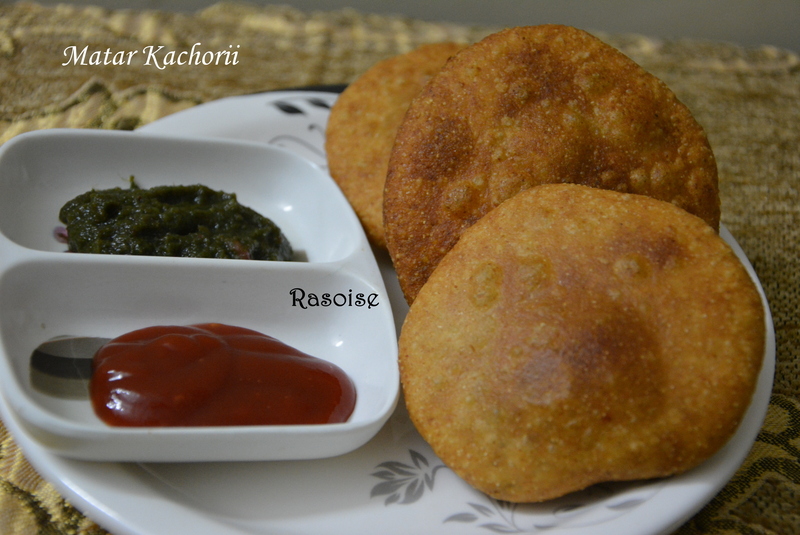 Fry the kachoris till crisp and golden brown. Thank you for visiting Rasoise!! We are sisters who have started this food blog with the blessing from our three mothers. We have grown up hogging and enjoying the home made food cooked by our mom. 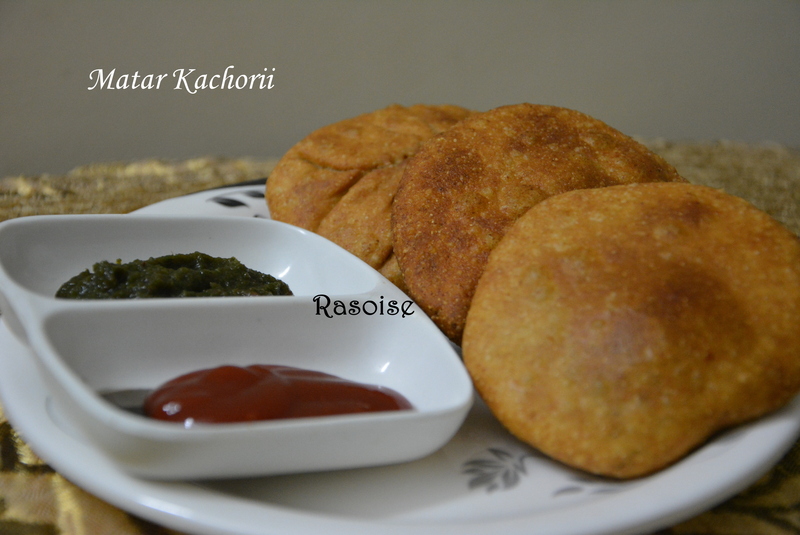 She is a true punjabi marwari who brings life to each food recipe she will make. I am a learner while Nancy has an upper hand with learning’s from mom and her mother-in-law. It is a family blog where we all will try and put together our family recipes. The cooking for these recipes will be done at both Nancy’s and my kitchen. The blog will contain both vegetarian and non vegetarian recipes. Most of the vegetarian recipes come from Nancy’s kitchen and Non Vegetarian from my kitchen. We are also taking help from cookbooks and internet to present a good recipe. The recipes are presented in a simple way so that even bachelor’s can try recipes from our blog. The content creation, photography, editing is done by Nancy and me. Posting of the recipes and IT related aspects of the blog is taken care by me. Hope you enjoy cooking with Rasoise!! You can contact us on rasoise26@gmail.com! !